Borne from the meeting point of the manifold interests of violinist Flora Curzon and cellist Francesca Ter-Berg, the duo�s compositions and arrangements are infused with modes and forms from traditional Transylvanian, Klezmer, Romanian, Greek and Armenian music which they have studied for over a decade with teachers of such folk traditions. Fran & Flora approach their reinterpretation of styles and deliveries not by homage, but by interweaving. Threads of deep-rooted musics are neatly and uniquely braided with experimental electronics, ambient drones and vocal processing. The results - as evidenced on the glorious, entrancing Unfurl - are simultaneously reverent and authentic, deeply personal and intelligently informed. Curzon and Ter-Berg - both established collaborators and string players - met through their work with such groundbreaking artists as Mercury Prize winner Talvin Singh MBE, Sam Lee & Friends (BBC Folk Award winner), Floating Points, Portico Quartet, Dunajska Kapelye, the London Klezmer Quartet, Cosmo Sheldrake and Frank London of The Klezmatics among others. Years of mutual collaboration have accorded the duo a deep musical bond that goes beyond a shared band membership. Unfurl covers a breadth of material, both musical and thematic. Traditional folk songs are sung in both Romanian and Yiddish, while pre-release single �Mayn Rue Platz� is a modern performance and interpretation of a poem and melody by early New York-Jewish writer (of the �Sweatshop Poets� group) Morris Rosenfeld. 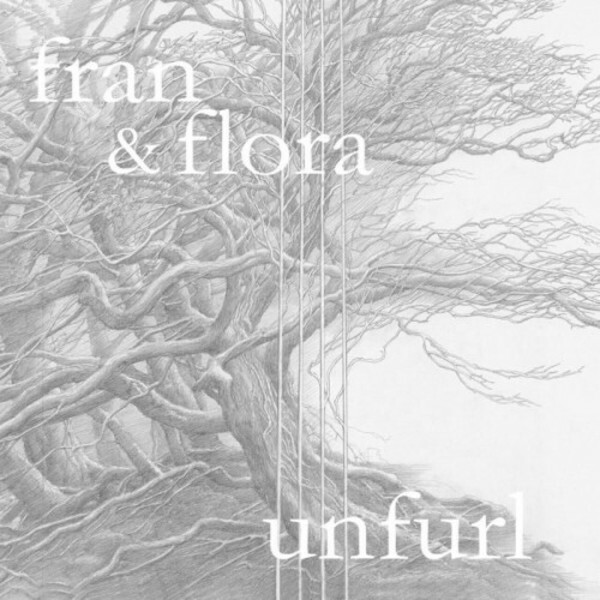 Fran & Flora also name as influences Shostakovich, Bach, Tcha Limberger, D�angelo, Alice Coltrane, Kaitlyn Aurelia Smith, Elka Vulcheva, Nils Okland, Gabi Lunca, Petro Loukas, Elizabeth Walfisch and Alan Bern, effectively capturing the huge range of their own expression. Present here, in abundance, is the elegance and poise of those classical reference points, flowing freely and boldly alongside the strange magic of the modern. Recorded by Hejira�s Sam Beste, and further augmented with guest performances by contemporary composer, violin virtuoso and horse-whisperer Linde Timmermans and London-based experimental percussionist and improviser Simon Roth on frame drum, Unfurl also features artwork by Oscar winning Lord of the Rings� lead concept artist Alan Lee, a collaborator of suitable pedigree to such a rare work.